Melbourne is easy to explore by public transport, bike or car. Skybus travels 24 hours a day to and from the airport to Southern Cross Station, and between 6.30am and 6.30pm buses depart every 15 minutes. Skybus will also pick you up from your city hotel. The journey takes about 25 minutes. Taxi fares between the city and the airport are about $60. There are no train or tram links to the airport. With more than 70,000 car spaces in central Melbourne, parking in the city is quick, easy and safe. On-street parking is available, with 3000 marked parking bays in the central city. Parking restrictions are in operation to help make these car parking spaces available for shoppers, visitors and residents. There are also 140 commercial car parks, with most offering short-and long-stay deals, early bird specials and disabled access. With dedicated bike tracks and a network of on-road bike lanes, it's simple to take in the Melbourne sights by bike. Melbourne Bike Share operates from many docking stations throughout the city. Bring a helmet, swipe your credit card and you can have wheels for half an hour, a couple of hours or a full day. 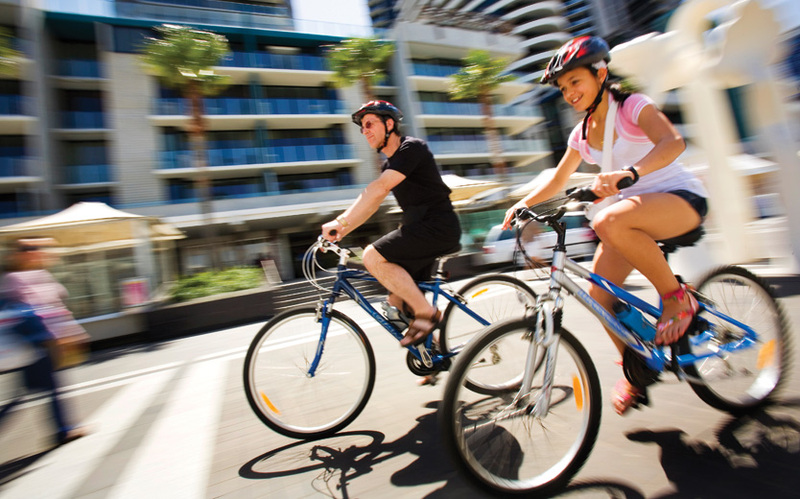 Riding without a bike helmet is illegal in Australia. You can purchase helmets from vending machines at Southern Cross Station, Melbourne University and at 7-Eleven stores. Melbourne taxis can easily get you around the city and beyond. You can hail a taxi from most inner city streets. You may also visit a taxi rank, or telephone and book a taxi – ask the visitor centre staff.